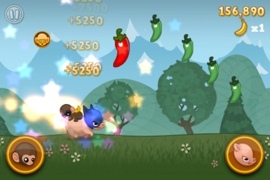 Baby Monkey (Going Backwards on a Pig) is an adorable endless runner. The name alone should pique anyone’s curiosity enough to download it. But if not, here’s the rundown. This is an endless runner with a twist: you control two different characters. You make the monkey jump with the left button and the pig jump with the right. There are some combinations of the two to get them to jump even higher. 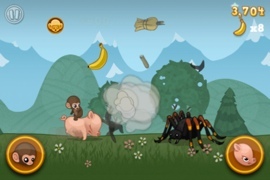 In order to survive and get a high score, you need to collect bananas with the monkey, jump over gaps with the pig, and make sure the monkey’s not on the pig’s back when he charges into obstacles. Endless runners and side-scrolling platformers are not my favorite genre, but it’s hard not to get sucked in by these cute little critters. The game takes some getting used to, since there are several types of jumps to master. But once you get the hang of it, it’s pretty addictive. 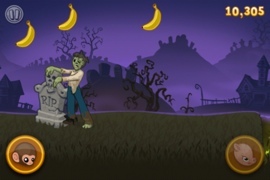 While you’re collecting bananas, there are also power-ups and some Monkey Bucks scattered throughout the game. 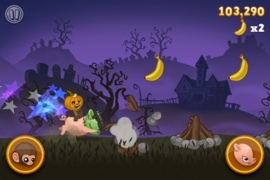 Monkey Bucks can be used to purchase items from the shop like the Halloween costume (which gives you the spooky Halloween theme), wings (which allow you to continue your game where you last fell off) and even a Super Monkey costume to make the game a lot easier. The costumes can be equipped and unequipped at any time once you’ve purchased them, but the wings are single-use only (and only one “continue” is allowed per game, so don’t think you can just keep using wings to soar to the top of the leaderboards). If you’re not finding Monkey Bucks fast enough for your taste, you can get five friends on Game Center to download the game and get a bonus 1500 MBs! There’s also a Tapjoy wall where you can earn more MBs. And last but not least, you can purchase them with IAPs to help support the developers. The ridiculously catchy-bordering-on-annoying soundtrack is worth the download alone. Within seconds you’ll have it stuck in your head, yet you won’t even mind it. The song is by Parry Gripp, who wrote it for a YouTube video of a baby monkey riding backwards on a pig. It’s fun, it’s catchy, and it (almost) never gets old. It was actually the inspiration for the game. 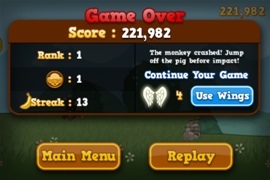 The 2D graphics are fairly detailed, considering most of what you see is the pig and monkey. The facial expressions on the two animals are priceless. It’s not even so devastating to lose when you get to see the dazed monkey hit the ground with stars spinning around his head. For a game based primarily off of a YouTube video and song meme, it is surprisingly high in quality and a pleasure to look at. I highly recommend you use some Monkey Bucks to buy the Halloween costume for an even better visual experience. This is an endless runner, so the main replay value here comes from trying to last longer, go farther, beat your high score and make it to the leaderboards. If you’re into that sort of thing, you can’t go wrong here. There are also plently of achievements to strive for. JTYAW334ANAW The task of controlling two characters instead of one adds quite a bit of challenge for those who have mastered the typical endless runner. The environments do get repetitive after some time, but there is still a lot to see, especially with the optional Halloween theme. The developers also promised an Xmas theme soon to come, which I can’t wait for! If the name is not enough to convince you, the soundtrack should get you to download this game. Even if you’re not an endless runner fan, this is a game that everyone should try. It’s got the whole package — fun gameplay, humorous graphics, and a catchy theme song. It’s currently free in the app store, so you have nothing to lose but your mind (“the world has gone insane”)! 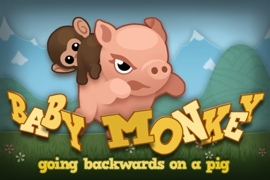 Great post ive bookmarked it on Digg under “Baby Monkey (Going Backwards on a Pig): Game Review Adventure App Unwrapper”. So hopefully our friends can give you a visit. Cheers!